LDW is a leading competence centre for DC machines. Our expertise has developed and been proven over many decades. As one of the few globally active manufacturers, we are able to replace machines from other providers with one from LDW – taking into consideration electrical and mechanical specifications and adapting them to customer-specific applications. The machines are individually adapted to the respective application. Our spectrum ranges from small DC machines to very large products. All machines are manufactured individually according to the requirements of our customers. Continuous research and development has in recent years led to great improvements with regard to space utilisation and maintenance requirements of DC machines. In addition, the thermal and magnetic efficiency was increased and materials were optimised. The service life of brushes was significantly extended through this process. LDW manufactures DC motors and generators in the power range from 10 to 8,000 kW. DC machines have a high power density, are especially compact and can be used in many different areas. Our machines are state-of-the-art and meet all current requirements of mechanical engineering and construction. DC machines from LDW have excellent control characteristics and clear control structures. These machines run quietly, have outstanding concentricity properties and high run-up torques from standstill. DC machines do not have voltage peaks thus avoiding high insulation stress. They are distinguished by high electromagnetic compatibility. This means that normally no additional measures are required to minimise electromagnetic disturbances and increase interference immunity. 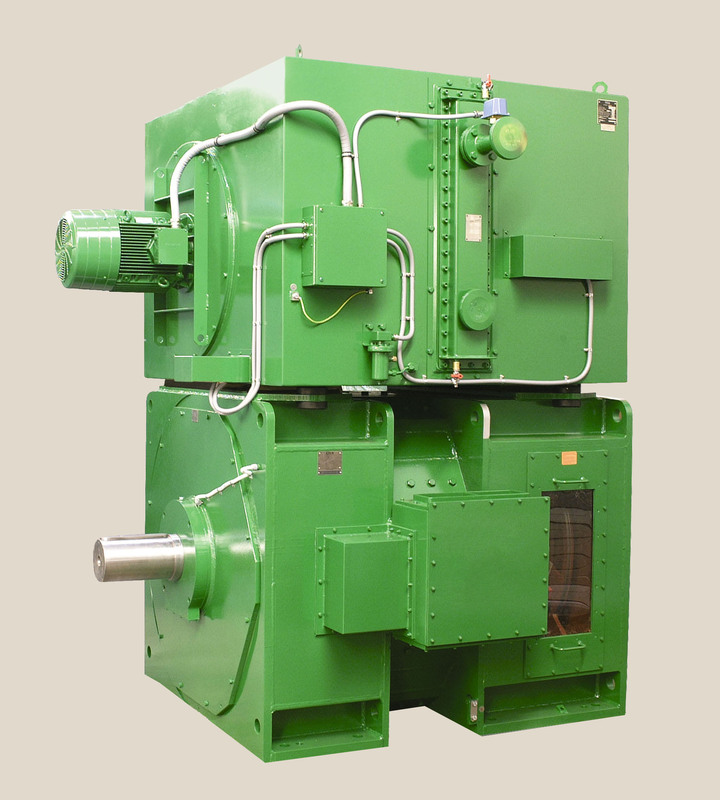 LDW manufactures DC machines in all standard types of protection and cooling. We offer machines in horizontal and vertical designs that are adapted to the respective customer requirements. The angular shape of our DC machines makes them extremely compact and highly adaptable to the operating conditions on site. For shaft heights up to 315 mm the equipment can include square terminal boxes that can be rotated by 90 degrees. This allows the cables to be fed from an axial direction as well. Due to the optimal arrangement of the attached radial fans they have little outreach. DC Motors from LDW are manufactured according to temperature class “H” (up to 180 °C). If the motors are used in accordance with class “F” (up to 155 °C), the service life of the insulation materials and therefore the winding is increased accordingly. We offer a number of different options for optimal cooling of the machines: from enclosed, surface-cooled machines and internally cooled systems with external cooling through to air-air or air-water heat exchangers. Our DC machines are designed to allow incremental encoders and standard brakes to be fitted. Since we use standardised components, the machines can be installed horizontally or vertically. Heat exchangers, pipe connections and a proven, comprehensive range of accessories can also be fitted as required. The brush apparatus has a user-friendly design so that the brushes can be easily replaced. More questions about DC Machines?